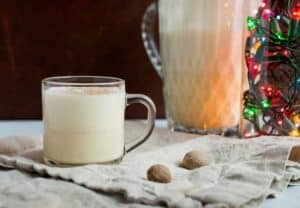 A simple but delicious homemade eggnog recipe with some optional bourbon stirred in. 1) Separate your yolks and whites for four eggs. 2) Put the whites in the fridge and start with your yolks. Whisk yolks until they are light in color. Add in sugar and continue to mix or whisk. 3) Now combine your milk, cream and nutmeg in a medium saucepan and put it on medium heat. If you don’t want to pasteurize your yolks, skip this step entirely. Heat this to just below boiling temperature. Probably around 170 degrees. You shouldn’t be able to keep your finger in it. 4) To temper the yolks, slowly drizzle in a cup of the hot liquid into your eggs. Keep mixing the yolks while you do this. 5) Then once your cup of hot liquid is mixed in with your yolks, your yolks will be up to temperature and you can slowly add them back to your saucepan. 6) Return to medium-low heat until it reaches 160 degrees. Keep whisking it and it will only take a minute or two. You can then be assured that your eggs are safe. Add in your brandy if you are using it and stick the mixture in the fridge to chill out. 7) Meanwhile, whisk egg whites until light and fluffy. They should hold stiff peaks. Whisk in an extra tablespoon of sugar to help them out. 8) Fold egg whites into the yolk base. 9) Serve chilled eggnog with cinnamon. This delicious recipe was brought to you by Macheesmo. Read the full post at https://wp.me/pkSYO-m8.